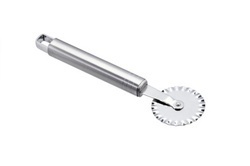 We are engaged in offering a wide range ofChef Gadget Set.They are made of stainless steel. Available in various designs and shapes, these products are highly acknowledged in the market. We are amongst the leading names in the industry, offering wide range of Metal Spoons that is acknowledged among the clients for optimum quality and high strength. We offer them ingrained standard sizes and designs and can be customized as per the requirement. With the assistance of experienced professionals, we Rae able to deliver world-class range of products. Our company name is a reliable name, which is looked up by the clients for the manufacturing and exporting of Cutlery Sets. Made from Stainless Steel and Brass Material, these Cutlery Sets are available in various patterns and designs to match up the international standards of markets. The Cutlery Eco Set we offer are comprised of forks and spoons. The Cutlery Eco Set that we offer are the asset for any kitchen and are used in hotels, homes and restaurants. We are offerings Cutlery Eco Set set at the reasonable prices and with superior product quality by using high graded raw material and in different types of sizes and shapes with wide range of products. 51 Count Combo (Fork, Spoon & Knife) Pack is also provided by us to our customers. The raw materials used are best and thus we provide you the finest quality in the world meeting all the testing parameters. Owing to the dexterous professionals, we have been able to provide the customers with a commendable range of Salad Cutlery Set. Our products are designed as par the prevailing market trends, making use of optimum-grade raw-material sourced from the famed vendors of the market. We are instrumental in manufacturing a wide range of Deluxe Cutlery Set. We manufacture and design an exclusive variety of attractive, beautiful, stylish and delicate Silver & Gold Plated Cutlery Set for our valued clients. 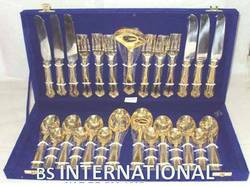 Our Cutlery Set available in various designs to meet with the requirement of various kinds of clients across the world. We are involved in offering wide range of Cutlery Set. These products are manufactured using high grade raw material. Moreover, our entire range is available in various shapes, sizes and specifications. Furthermore, our cutlery is manufactured in such a way that it is rust and odor resistant and comes in smooth and attractive finishing.